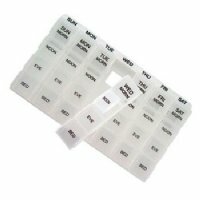 A great organizer for your medication or vitamins for the week. Fill it once a week, use it everyday. These now come in assorted colors, but color choice is not available. Size: 9" x 5-1/4" x 1"